Stock # 6S104732, 427, Manual, 20575 mi. 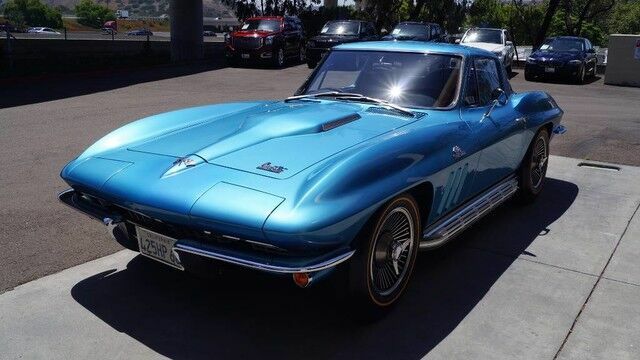 We are pleased to present this 1966 Corvette Stingray Coupe in Nassau Blue with Black Vinyl. The car is a St. Louis build car assembled on November 22, 1965. The car was restored by its previous owner and was awarded BCRS Top Flight Gold in 1996. The car is numbers matching with some rare delete options. The car was ordered new without Power Windows, Power Brakes, Power Steering and Radio. The VIN# is 194376SI04732, Assembly code is C22. The Engine Block Number is 3869942 (427 Engine Block for 1966). Block Casting Date is 1/3/5 (September 3, 1965, Right Cylinder Head is J-22-5 (10/22/1965. Left Cylinder Head is J-18-5 (10/18/1965. Water Pump is I-11-5 (9/11/1965). Voltage Regulator is 5K (Nov 1965). Alternator is 5-K-7 (1965/Nov/7 th ). Distributor is 5-8-1 (1965/Aug/1 st week). Carburetor is 5-92 (1965/ Sept/2 nd week). The car just received a basic service and new tires and is ready to be driven. Please contact Stephan at 858-361-6000 with all questions.